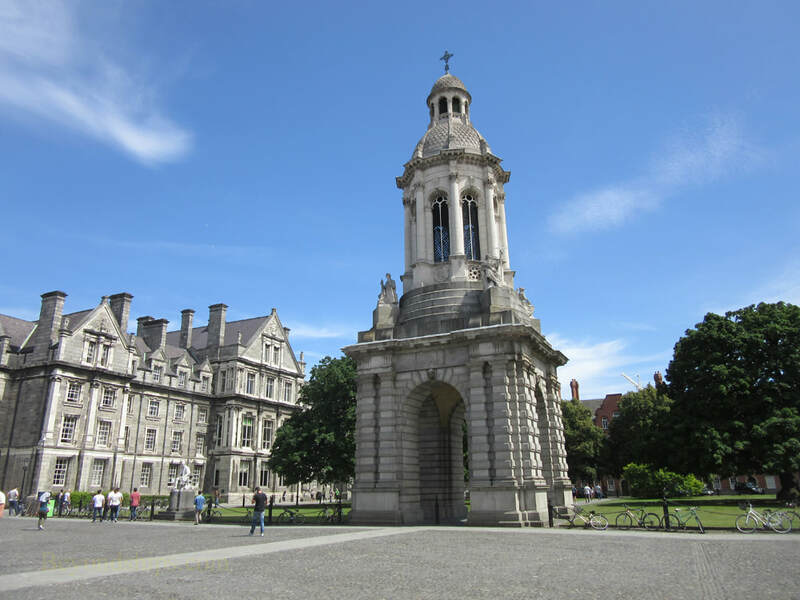 Trinity College, Ireland's oldest university. Dublin has a very long and involved history. Therefore, we shall only attempt to touch upon the major points needed to understand the significance of its historic sites and the local culture. Although there may have been earlier settlements, most historians say that today's Dublin began with Viking settlements established in the 9th and 10th centuries. One of these was called “Dyflinn,” meaning “Black Pool.” It is thought that this was a reference to a deep pool that existed where the River Poddle entered the Liffey near where Dublin Castle is today. Over the years, the name transformed into Dublin. Three centuries of Viking rule ended when the city was captured by King Dermot MacMurrough of Leinster with the aid of Anglo-Norman mercenaries. MacMurrough had obtained these mercenaries with the blessing of King Henry II of England. After MacMurrough died, one of the Anglo-Norman lords known as Strongbow claimed the right to succeed him as king. However, he transferred his claim to Henry. In 1171, Henry arrived in Ireland with some 4,000 knights in order to secure his claim. Henry was proclaimed “Lord of Ireland.” This was the beginning of English rule in Ireland. Dublin became the seat of English rule. Many of the Viking inhabitants left the city and were replaced by settlers from England and Wales. The English government continued to show a lack of interest in its Irish colony until a rebellion sought to place Ireland under the control of the Holy Roman Empire. Recognizing that Ireland might be used as a backdoor to invade England, Henry VIII began a campaign to bring all of Ireland under his control. In 1541, the Irish Parliament in Dublin declared him “King of Ireland.” Then through a series of military campaigns, persuasion, bribery, and coercion, Henry sought to bring his Irish subjects to heal. This campaign continued through the reigns of Henry's three children who followed him to the throne. However, Ireland was not subdued until 1607 under King James I. During the 18th century, Dublin became the “second city” of the British Empire after London. Dublin was growing and becoming more prosperous. City planning saw the elimination of medieval slums, the widening of streets and the construction of many fine town houses. In addition, many of the landmark buildings that you see today in Dublin were built during the Georgian period. Culturally, Handel's Messiah was given its first performance in Dublin and writers such as Jonathan Swift (Gulliver's Travels) were working in Dublin. However, this Golden Age was primarily enjoyed by the upper class known as the Protestant Ascendancy. There still was considerable poverty, crime and overcrowding for the lower classes. The rebellion of 1798 caused Britain to re-think its administration of Ireland and the Irish Act of Union was passed in 1800. Until then, the British legal claim to Ireland was based upon the fact that the same person was king of Great Britain and king of Ireland. With the Act of Union, the kingdoms were merged to become the United Kingdom of Great Britain and Ireland. Since it was now a single kingdom, only one parliament and one capital city were needed. As a result, Ireland lost its own parliament and Dublin was no longer a capital city. Not only did this mean that the Irish had less voice in government but economic conditions deteriorated in Dublin because there was no longer the spending that had occurred when people came to Dublin for the parliamentary sessions. 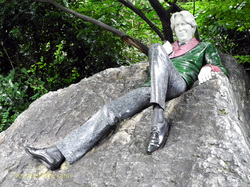 Oscar Wilde (left) is one of many famous writers who lived in Dublin. 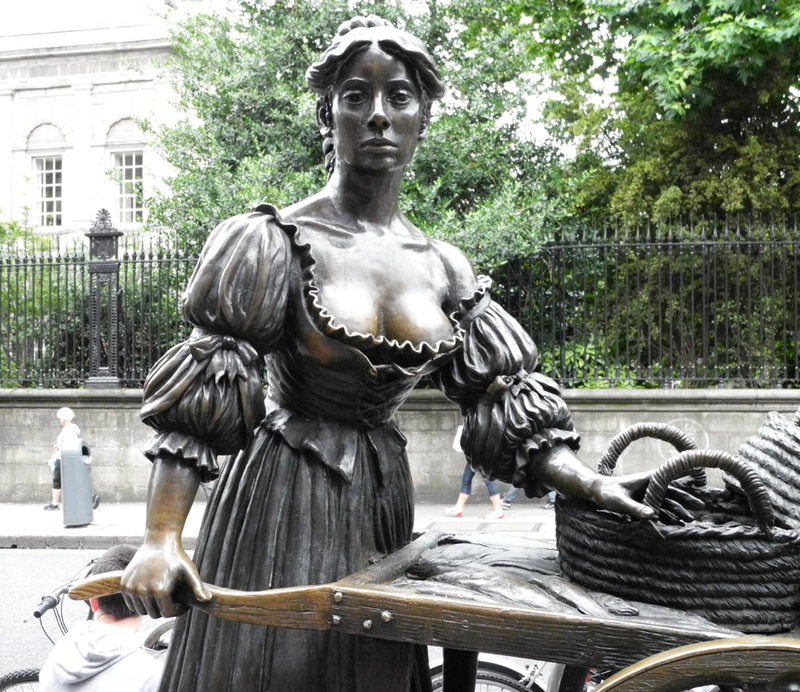 Molly Malone (below) was a legendary inhabitant. Above: Leinster House was built in the Georgian era as the home of an Anglo-Irish lord. It is now the home of Ireland's Parliament. The 19th century saw much agitation for Irish rights and for self-government. Some like Daniel O'Connell and Charles Stewart Parnell pursued peaceful means. Others turned to violence. At the same time, Dublin was experiencing a literary flowering. Oscar Wilde, George Bernard Shaw, James Joyce and W.B. Yeats, all lived and or worked in Dublin at various points in their lives. By 1914, the campaign for self-government had resulted in the passage of an Irish Home Rule Bill by the British Parliament under which Ireland would have become a self-governing part of the British Empire. However, with the beginning of World War I that August, home rule for Ireland was suspended. During Easter 1916, a group of radical republicans seized a number of Dublin's important buildings and declared the existence of an Irish republic. ("The Easter Rising"). British troops were called in and after a week of intense fighting, the republicans surrendered. At first, the general population of Dublin was opposed to the Easter Rising. Many Dubliners disliked the violence, destruction and disruption. Others had friends and relatives who were fighting in the British Army in Germany. Still others thought that self-government would come eventually by peaceful means. However, the British government's harsh reaction to the rising turned the tide of public opinion. Britain regarded the rebellion as a stab-in-the-back, coming at a time when Britain was fighting a life and death struggle with Germany. Consequently, Field Marshall Lord French ordered the execution of 16 of the revolutionary leaders who had surrendered. As a result, in the election of 1919, republicans won nearly all of the Irish seats in the British Parliament. 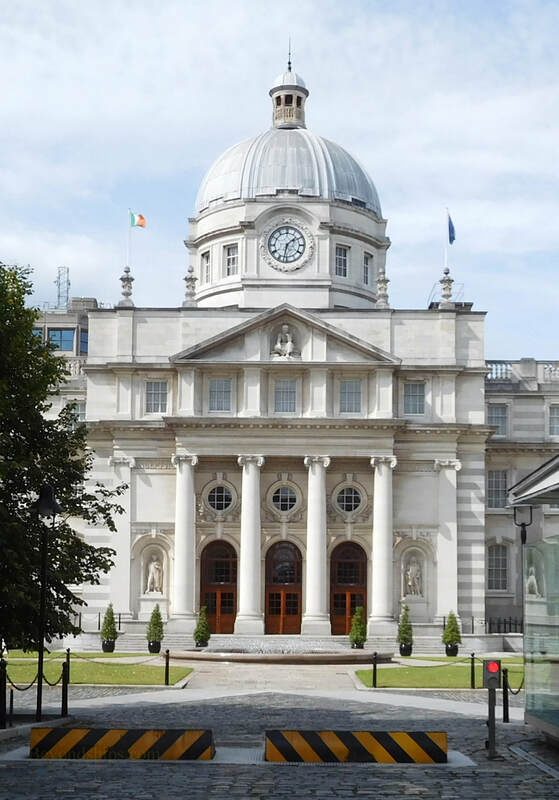 Rather than going to London to take their seats, the new MPs met at Mansion House in Dublin and again declared the existence of an Irish republic. The Irish War of Independence followed. In December 1921, the two sides entered into a treaty under which Ireland became a dominion of the British Empire similar to Canada and Australia. It would be called the Irish Free State. (Six predominantly Protestant counties in the north of Ireland almost immediately exercised their right under the treaty and exited the new state in order to remain part of the United Kingdom). Radical republicans were not satisfied with anything short of complete independence and so the compromise was followed by civil war. The new government eventually suppressed the insurrection in 1923. Dublin was now the capital of the Irish Free State and in 1937, it became the capital of the Irish Republic. This came about as the result of an election in which a narrow majority voted to adopt a new constitution, thereby ending ties with Britain. Ireland remained neutral during World War II. However, a section of Dublin was bombed by the Germans on May 31, 1941, allegedly by mistake. Dublin largely escaped “The Troubles” that plagued Northern Ireland from the 1960s to the 1990s. After joining the European Union in 1973, Ireland experienced an economic boom known as the “Celtic Tiger” as it transformed itself from an agricultural economy to a technologically advanced economy. Evidence of this era can be seen in the various modern buildings around Dublin. The boom came to an end with the worldwide financial crisis of 2008. Ireland was left with a massive debt, which it struggled to manage. However, Dublin now appears to be on the upswing.